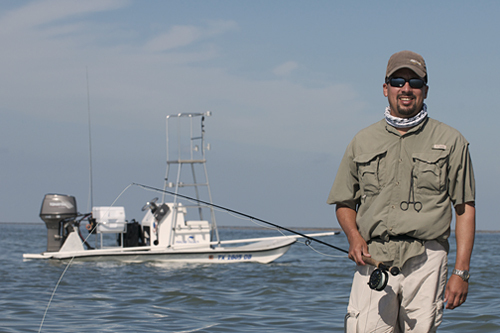 Mark Becerra works the flats of the Lower Laguna Madre last week in South Texas. I managed to wrangle a ride on the Penche’ Mosca for both myself and brother-in-law (who will go by BP since he may have called in sick) last Friday before the joyous event of my Grandmother’s 90th. birthday in Weslaco, Texas. We met Mark Becerra at the Arroyo Colorado Thomae Park ramp Friday morning about 9, and knew we had about a half day to seek out, find and catch. I am not positive about the boundaries, but I think the Thomae Park is part of the Laguna Atascosa Wildlife Refuge.We trimmed our gear down to what was really necessary, plus my waterproof Lowe Pro camera bag loaded to the hilt with gear for any fish photo op. We looked and ran the flats from within site of Port Mansfield, to within site of the tallest building of South Padre Island, stopping several times in the clear saltwater to hop off the scooter, fan out and wade the flats on the edge of the sand and back. 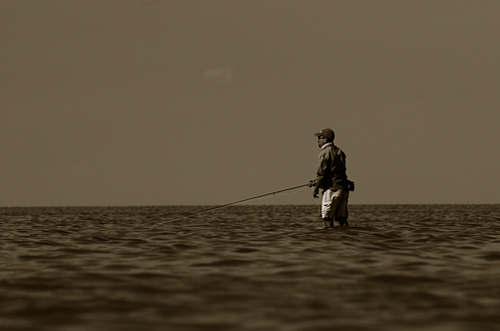 Fish were not bunched up, birds weren’t working, and we collectively saw only a hand full of reds between ten and two. We did see thousands of ducks, other exotic birds and a very big whitetail buck and his mistress running through the edge of the marshes, and away from our noisy intrusion into their world on six inches of water. We did see hundreds of stingray and other rays, thousands of baitfish, small trout and reds, all beating a hasty retreat as we flew over them on a thin sheet of water. Becerra and the Penche’ Mosca on the flats of the Lower Laguna Madre. Water scooters are amazing boats adapted for a very specific purpose and a pedigree I am very familiar with. You see, the first boat I really worked on was an old scooter my Grandpa had. It was made of plywood with a plywood box for the center console-seat-box that held the gas tank. The gas line squirmed out a hole in the rear of the box and to an old Evinrude. The Evinrude was old even then, and the scooter was leaking along its seams. My assignment was to re-glass the hull seams, sand that down and paint the entire boat with epoxy paint. This was no small job for a thirteen-year-old kid who didn’t know a thing about fiberglass. So, it sat for awhile until I finally talked myself into believing I couldn’t hurt anything by glassing a leaky boat. Things were going fine at first, but at some point I mixed the chemicals out of proportion and the bucket caught on fire. Now a chemical fire such as this can only end by smothering it out, which is how this one ended. I am pretty sure I was able to get a little help after that, from my Stepfather (G) who must have been wondering just what he had gotten himself into by then. In the end, the boat was patched, painted and launched. The scooter is an interesting boat – a flat bottom that delivers every little vibration of every little ripple on the water, a boat that turns on a slide rather than a V digging into the water and since the turns are based on the motor only, a boat that can tilt radically on a sharp slow turn. And that’s exactly what happened to us, my Stepfather and I, in just about the same place where we launched the Penche’ last Friday. The motor on the old scooter was “finicky” on a regular basis, and we started it by wrapping a wood handled braided cotton rope around the flywheel on top and giving it a yank. If she was being “finicky”, yanking the rope was combined with a manual choke and sensitive throttling up to full. On the side was the forward / neutral / reverse. Well, to make a short story long, G had the motor in gear, and turned, so we did a half a donut and flipped her completely over. The motor was still running for a second, upside down, top under water, and everything was mass confusion. Somehow, in an instant we got a hold of one side of the scooter (water was about chest deep), and flipped her back upright. Everything that was on the deck was gone, rods, tackle boxes – everything. So, while G was diving down to retrieve everything and coming up with it a bit at a time, a boat pulled up to see if we were all right. They had apparently seen the flash of the bottom of the boat as it went over, and those were the days when good samaritans were good, and we thanked them and they were off. Crazy enough, the scooter started again and we were done for that day – hightailing it home to tell the story. I may have told that one before, but it fit nicely with the sentimental ride on Mark’s scooter last week. If you check the archives here, I bet there is something on the scooter saga back there somewhere. Although we didn’t catch any fish, it was like a rocket ride over the top of Sea World, and off to the sides was Bird World. There were so many different water foul that it was impossible to keep up and identify them all. Let’s just say the ducks ruled the day, with their count in the hundred thousands. Not dozens, not hundreds, but hundred thousands. It was fantastic. For this trip, for perhaps the first time, my focus shifted necessarily away from the lack of fish – toward the environment toward my surroundings and finally toward the next time, the next ride on the Penche’ Mosca. Afterword – Thanks for the ride Mark Becerra. Thanks for going along with me BP, and I hope we can hit the salt in your area on Black Friday.